On the Thirteenth day of the 25 days of MOMS Christmas favorites we found TWO great gift ideas to share with you and giveaway so be sure to enter BOTH of them. The First FUN gift item we found are Sock Grams "Stuff your loved ones' stockings with socks this holiday season! But not just any old socks, a colorful Sock Gram that's either holiday-themed or chosen to match your interests. A great gift for loved ones across the country, Sock Grams are an inexpensive, yet thoughtful way to show someone you care. Sock Grams' novelty socks come in myriad patterns and colors, perfect for holidays and special occasions, as well as just saying hello. Each pair of warm and fuzzy socks comes with a personalized greeting card and free delivery across the country. Christmas socks include Reindeer Lights, Smiling Snowmen, Bringin' Home the Tree, Angel Ankle, GingerbreadHouse and Christmas Lights. Hanukkah socks feature menorahs and Stars of David, while Valentine's Day socks are covered in hearts. Other designs highlight individual hobbies, professions and even simple pleasures, such as coffee (Thanks a Latte, anyone?). Favorite animals, sports, foods, flowers, holidays and pastimes are highlighted with unique socks for each preference. By thoughtfully sending someone a Sock Gram that acknowledges their likes, you're showing them you appreciate their unique character. Whether recipients choose to stuff their stocking with Sock Grams, or wear them out or around the house, or simply keep them in a drawer; these socks draw a smile every time someone looks at them. Popular styles, including Goldfish Glub Glub, which is designed so that the goldfish appears to be eating the wearer's leg, and Sneakers, which look like real Converse sneakers, are cute and heart-warming at the same time. With different selections for men, women, children and babies, Sock Grams has something for everyone. Not only does this fun gift come with a personalized greeting card, but a .25 fl oz packet of Medi-Spa Foot Balm and gift-wrapping is included, too. Best of all, this calorie- and maintenance-free gift is delivered to your loved ones for only $11.95. " 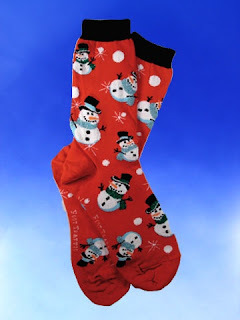 Sock Gram and 24/7 MOMS are giving away a pair of FUN snowman Sock Grams . To enter for your chance to win enter your name and email address in the box below you will be signed up for todays Sock Gram giveaway as well as be added to the 24/7 MOMS E-list(if you are not already a 24/7 MOMS subscriber). So, Moms Get into the spirit of Christmas with personalized letters from Santa sent directly from the North Pole and created es pecially for your children! They’re offering 6 different formats including 4 similar styles for siblings that focus on the true meaning of Christmas; along with a new baby format and a secular coloring page format. You can send personalized letters from Santa Claus to your children directly from the North Pole! Letters are $5 by cash or check or $6 through Paypal. 100% of all proceeds from this Santa Letter Fundraiser will go to Wabash MOPS. To take advantage of this fun offer, just complete the information form for personalization at their website (http://www.wabashmops.com/christmas-letters-from-santa.html) and choose the format that you like best. Letter orders received by December 10th will be mailed from the North Pole, including North Pole postmark, in time for Christmas. Wabash MOPS and 24/7 MOMS are giving away a personalized Christmas letter from Santa to 2 lucky winners! To enter for your chance to win enter your name and email address in the box below you will be signed up for todays Sock Gram giveaway as well as be added to the 24/7 MOMS E-list(if you are not already a 24/7 MOMS subscriber). Winners will be selected on December 6, 2008, using the random number generator at random.org. I enjoy reading your blog. Thanks for sharing your wonderful giveaways with everyone. Many Blessings to you.